Eastern and Western cuisines sometimes surprisingly agree on preparation and flavor combinations of certain ingredients. Pork chops is a good example. Most cuisines seem to agree that pork chops are best matched with some sort of sweet and or tangy flavor. On the Eastern side you have the Chinese sweet and sour pork or 糖醋排骨, Japanese katsu don, which is typically served with egg and onion cooked with sweetened dashi, and the Vietnamese grilled pork chops, served with a sweet fish sauce. On the Western side you have pork chops with apple sauce, and pork chops with barbecue sauce. In this recipe, Eastern flavors, such as mirin, Chinese five-spice powder, and ginger, are combined with Western styles, such as using apples and apple cider vinegar. 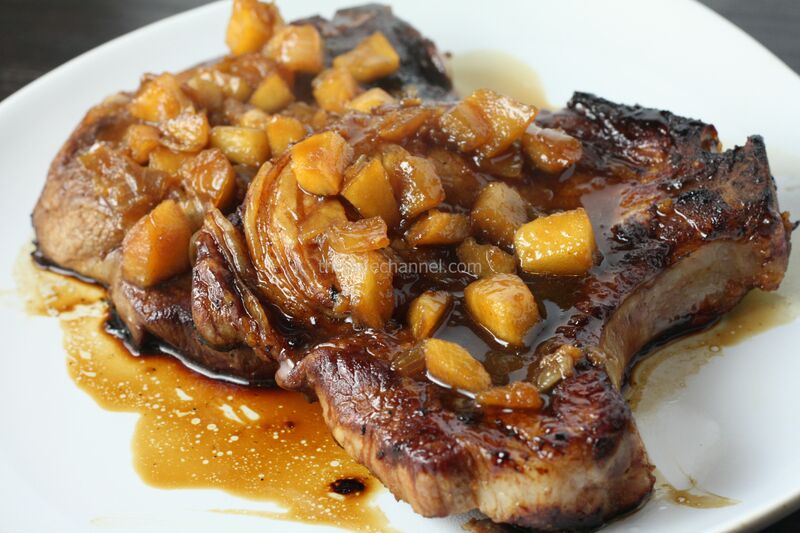 The result is a juicy and slightly sweet pork chop that has very intense flavors. Give it a try sometime! Marinated pork chops with teriyaki sauce for at least one hour. Remove pork chops from marinate and set aside. Heat oil in a saucepan over medium-high heat. Add onion, ginger, and cook for about 2 minutes, until the onion is translucent. Add the apple, sugar, vinegar, teriyaki marinade, and five-spice, and stir to combine. Lower the heat and simmer for about 10 minutes, until the fruit is softened and the liquid has thickened enough to cling lightly to the apples. Preheat a grill, cast iron skillet or pan. Grill pork chop for 4 to 5 minutes on each side until lightly charred and firm. Serve each chop with a scoop of the apple chutney.